Be prepared for a funky infestation. Scooter hasn't really been seen as a heavyweight in the deeper trance scene. In fact, a large number of DJs laugh at Scooter and consider them as nothing more than an overpuffed commercial project with only a minute amount of creativity and credibility. However, such could not have been said about the Ratty project when they released their first single, "Sunrise (Here I Am)" upon the scene. Surprisingly, some of the world's most prestigious DJs played the song in their sets to rave reviews from the crowds. It was a track to be enjoyed by all. So when people across the globe made a shocking discovery -- that Ratty was actually a side-project of the members of Scooter -- it caused them to re-evaluate their style of criticism. 'Perhaps a commercial band CAN create some excellent material!' 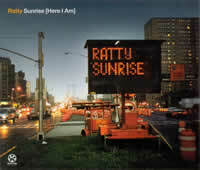 Ratty's "Sunrise (Here I Am)", though not a breakthrough commercial success, proved that Scooter... er, I mean Ratty... could play ball with the biggest names in the dance/trance arena and make the people move just as much as any other artist. Initially just a B-Side from Scooter's 2000 single, "She's The Sun", entitled "Sunrise (Ratty's Inferno)", this song eventually transformed itself into a worldwide sensation. In the Ratty single itself, we find four different versions of the same song. The Radio Edit is perhaps the most familiar version to all. Starting off with a wicked crinkly bassline, additional pads and acidic bass synths layer themselves in a funky and alluring fashion until the break, when angelic female vocals over equally heavenly reverbed pads sing elegantly to the crowds. The chorus itself seems to be a cover of an excerpt from "Song To The Siren", a song by the Cocteau Twins. A cover version? Well, it IS Scooter, after all. After the chorus comes a very gruff synth, later caught up with some of the acid sounds from earlier and even a bit of faded piano harmony. Eventually, the female vocals rejoin with the rest of the song once again for a full-on energy boost. For the lover of trance music, this is truly a marvelous piece and in a completely different league from what we could expect from a typical Scooter single. The Club Mix is basically an extended version of the radio edit, thus stretching it into a piece twice as long as that which you'd hear on your local radio station (if they played it all). The only difference is that the chorus is longer, featuring additional lyrics in the process. Those who enjoyed the Radio Edit will enjoy this. The Instrumental Mix is nothing new; although it is referred to as an "Instrumental" here, it is actually the same song as "Sunrise (Ratty's Inferno)", the B-Side from the Scooter single "She's The Sun". It is different from the other mixes available here, but still maintaining the same basic melodic principles. Finally, there is the Dub Mix which is extremely similar to the Club Mix, with few noticeable differences, and is more of a space holder. Ratty's "Sunrise (Here I Am)" has proven to everyone that even if Scooter has been known to make commercial and "cheesy" dance music, these three guys still have the chronic ability to create crowd-pleasing trance on the side. The song is solid and had certainly kept me entertained since its initial release back in 2001. It's definitely worth a listen.